/ Modified sep 6, 2017 9:10 a.m.
A rally at Tucson City Hall in support of the Deferred Action for Childhood Arrivals program, Sept. 5, 2017. Approximately 28,000 people in Arizona have deferred deportation status, and the president's announcement Tuesday that he will end the program in six months leaves them wondering about their options. President Donald Trump announced today, via Attorney General Jeff Sessions, that he would end the Deferred Action for Childhood Arrivals (DACA) program by March 5, 2018. The program allowed eligible people to apply for two-year work permits and the ability to go to school in the U.S. if they were brought to the country as children and are not here with a legal status. Trump hopes the move will prompt Congress to take action to reform the nation's immigration laws. 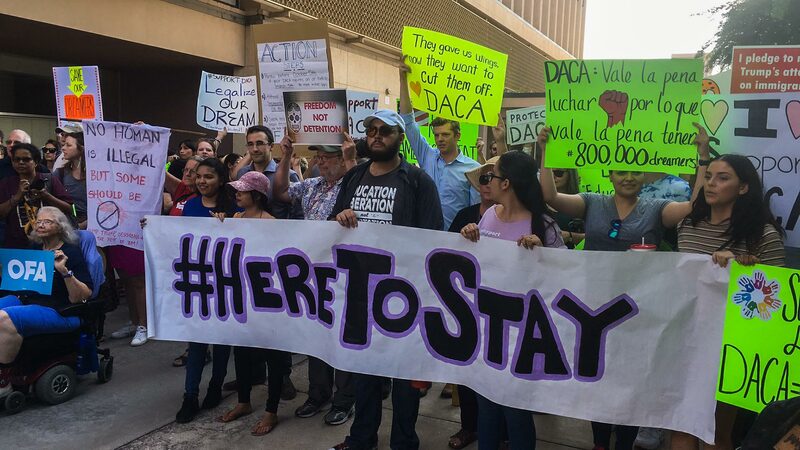 Among the recipients who reacted to the news today was a group of students at the University of Arizona, who gathered on the campus to demonstrate against the announcement that the DACA program will end in six months. Many who rallied are a part of the Immigrant Student Resource Center, including Ana Mendoza, who came from Mexico 17 years ago and has been in the U.S. most of her life. “With everything that's happening, this is just a space for folks who were impacted and allies to come and find resources, find other people who know what they're going through, and have a space that's welcoming,” she said. A fellow student and DACA recipient, Mira Patel, said students needed a place to vent. “This is a space that we thought we needed to have for students and community members to express their frustrations," she said. DACA student Perla Rojas said the anger comes because young people such as herself stand to lose out on the chance to thrive in America. But she says that won’t stop her. “Having this has given me the opportunity to continue to thrive and show the world that although this does hurt us and it does impact our future immensely, we’re not going to give up” — DACA recipient Perla Rojas. Politicians are now considering their options. Southern Arizona’s three members of Congress, Reps. Martha McSally, R-Tucson; Raúl Grijalva, D-Tucson; and Tom O’Halleran, D-Yavapai, all said Congress must act. Grijalva, however, said a bill to protect young, undocumented immigrants must do certain things. “Something that does not have these young people hostage for a fanciful, silly fence or border wall,” he said. Last week, McSally said she is working with the bipartisan “Problem Solvers Caucus” to come up with a solution. “I think one approach is to tie it to some reasonable border security and get enough Republicans and Democrat to support it, get the administration to support it,” she said. “Something that does not have these young people hostage for a fanciful, silly fence or border wall,” Rep. Raúl Grijalva said regarding future legislation from Congress. He said he will work with his colleagues on both sides of the aisle to craft a solution. Sen. Jeff Flake, R-Ariz., said Congress must act immediately to pass permanent legislation. “There are a lot of innocent kids counting on Congress to do its job,” said Flake. MORE: Arizona, Government, Immigration, News, U.S.